Need a unique low cost gift in a hurry for a birthday or Christmas? 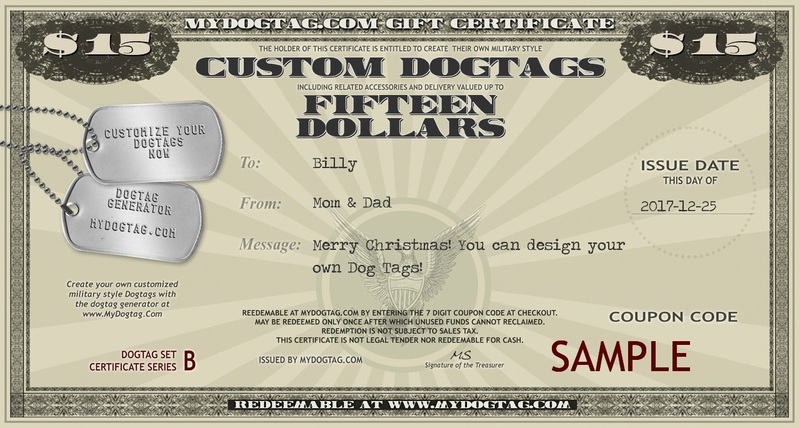 Want to let your gift recipient customize his own Dog Tags? A Gift Certificate is an ideal option! Modelled after vintage United States War Bonds, these printable gift certificates are an attractive way to present your gift of customizable dogtags without trying to guess what to put on them. You may choose any whole dollar amount you wish, however please ensure that you include enough to cover the cost of shipping to your recipient's location. We recommend a $15 certificate which will cover the cost of most dogtags and basic shipping. After purchase, your gift certificate image will be immediately emailed to you showing all of your customized gift information as well as a unique coupon code. Simply print it using your own printer, trim the edges, and make someone really happy! If you prefer to make and send actual dogtags to a gift recipient, we also offer Custom Gift Notes that can be included in the package. A Gift Certificate coupon code may be used only once. Unused funds on a Gift Certificate cannot be used or reclaimed after its initial redemption. The coupon code never expires.